Bilbao is city in Spain, the capital of the province of Biscay in the autonomous community of the Basque Country. With a population of 353,187 as of 2010, it is the largest city of its autonomous community and the tenth largest in Spain. 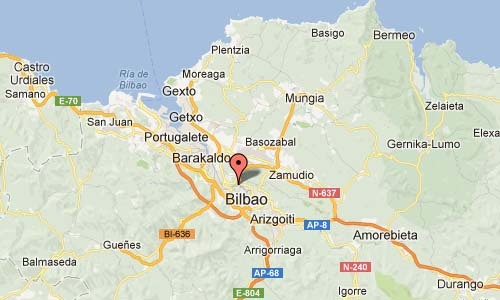 With roughly 1 million inhabitants, Bilbao lies within one of the most populous metropolitan areas in northern Spain. From the pictured street, Universidades Hiribidea, you get a wonderful view on the Bilbao Guggenheim Museum. On the picture, you’ll see the Pedro Arrupe zubia or Pedro Arrupe bridge. Built in honor of Father Pedro Arrupe next to the Guggenheim museum. Even though it was made ​​of steel, the inside is made of wood. It has the nickname Dragonfly Gateway. Ing. 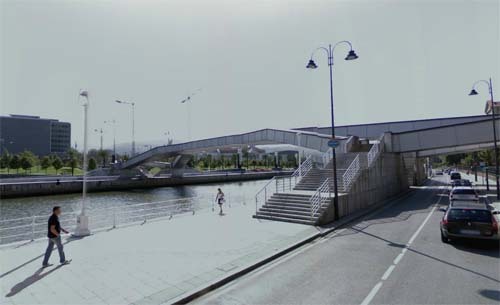 José Antonio Fernández Ordóñez designed the bridge and it was opened in March 2003.